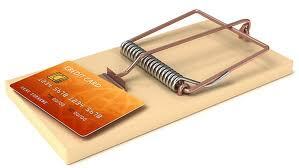 Don't fall for the bank trap of paying only the 'minimum payment' on your credit card balance! It sure makes some of us feel good, that things are not as bad as we thought they were. Let us say your credit card balance is close to $2000, a pretty heavy balance. If your CC company tells you that your minimum payment is only $30, you sure will think it is no big deal and that you can pay it. But problem is, these minimum payments are not there to make you feel good, even though it does help. It is a way for the credit card companies to get you further in dept and at the end of the day earn more interest money from you. Remember, the bigger and the longer your balance lasts, the more interest you will be paying. It is a trap that credit card companies don’t want us to get out of, despite what they tell you or try to portray as trying to help you pay your balance. The only good thing about making MP is that it is the limit at, or above which you won’t be penalized by the your CC company. How is the minimum payment on credit card balance calculated? -I generally prefer the second method but it is a matter of preference and what you are comfortable with. Depending on each individual situation, the minimum payment can vary from person to person. If you are really struggling and can barely make a minimum payment, then by all means, that should be your maximum payment. Otherwise and if you are doing OK, it is best to at least double or even triple your MP. So if your MP is $25, try to pay $50 or even $75. Another way is to alternate each month, with one month paying double your MP and tripling it next month and so on. This way, and assuming your balance doesn’t go up further, you will be paying your payment a lot sooner. Another way to pay off your balance sooner is to commit to a specific timeline. For example, you can specify 12 months as the time you will need to pay off your balance and bring it to zero. The monthly payments – or those in between- will obviously be bigger but at least you will save on paying more interest. To be specific, given a balance of $2000 and APR of 18%, you would need to make monthly payments of about $190 to eliminate your balance in one year. This would cost you only $201 in interest for 12 months. Compare that with making only minimum payment of $40 per month. It would take you some 20 years and $3,863 in interest! So, make it a rule and a habit: when you see ‘MP’ on your credit card statement, just ignore it completely and instead, multiply it by 2 or 3 at least, if not more. That is the payment you should be making.